An equal amount is withdrawn monthly. If you have a credit/debit balance when we settle your account annually, we will factor your balance into the calculation of your new monthly amount. 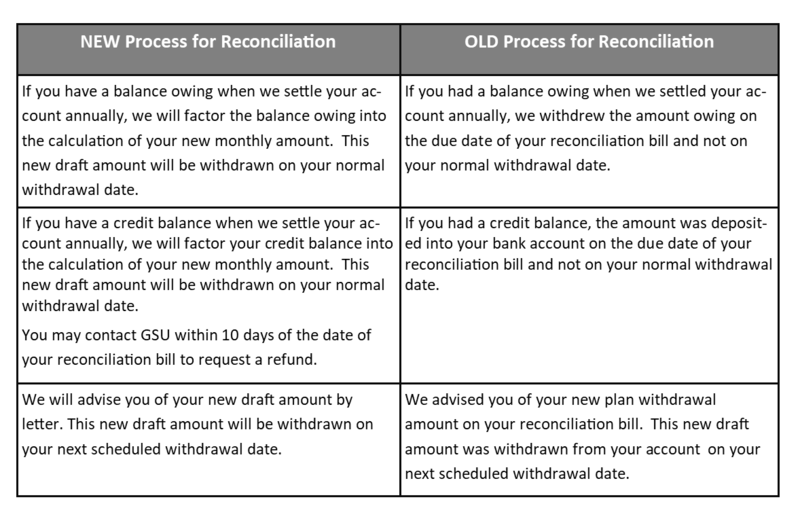 If you are registered for Equal Billing, we have changed the way that we reconcile your account. The amount of your current bill automatically withdrawn on the due date of your bill. Please note, it may take up to 10 days to receive payment. Please make sure to select GSU – Greater Sudbury Utilities and use all the digits (zeros included) when entering your account number. Please make cheque payable to Greater Sudbury Utilities and write your account number on your cheque. A deposit box is conveniently located at 500 Regent Street, Sudbury. Visit our main office, 500 Regent Street, Sudbury. Please see contact page for current hours. Citizen Service Center’s are conveniently located throughout the City of Greater Sudbury. View a list of locations here.